That agony is him suffering for the suffering of the bound souls in the material world. Him being the supreme father of every one, he was unable to bear the suffering of his children who are caught in the cycle of birth and death in the material world. One may question, if the supreme God will have any agony/sorrow – him being sathya kAma (one who can fulfill all his desires) and sathya sankalpa (one who can accomplish anything). Our AchAryas have explained that him feeling the pain for the suffering souls is also his auspicious quality. Just like an all-capable father who is happily living with his one child will still worry for his other child who is staying away from him on his own and struggling, bhagavAn, though being all-capable, he is feeling the pain looking at the plight of the jIvAthmAs in samsAram (material world) who are suffering since time-immemorial due to being covered by ignorance and lacking of true knowledge. To facilitate the upliftment of such suffering jIvAthmAs, he gives body and senses for the jIvAthmAs during srushti (creation), reveals the sAsthram (scriptures), himself descends in to the material world as various incarnations like SrI rAma, krishNa, etc. Even after all of these, the jIvAthmAs are not really willing to learn the true knowledge and accept his supremacy. Just like a hunter will catch a deer using another trained deer, He decides to uplift jIvAthmAs through other jIvAthmAs who are already in the material world. So he chooses a select few of them, blesses them with divine knowledge and makes them AzhwArs. AzhwAr means one who is immersed in bhagavath vishayam (spiritual matters). These AzhwArs appeared in various holy places in the southern part of bhAratha dhEsam as foretold by vEdha vyAsa in SrI bhAgavatham. Totally, AzhwArs are said to be 10 in number. 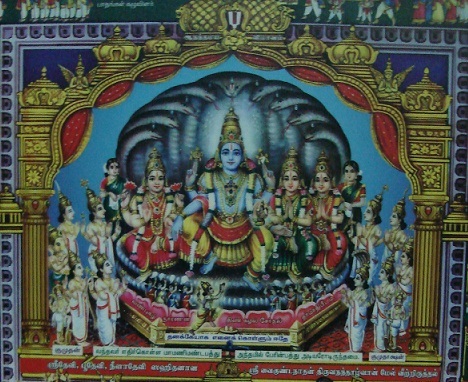 poigai AzhwAr (sarO yOgi), bhUthaththAzhwAr (bhUtha yOgi), pEyAzhwAr (mahathAhvaya), thirumazisai AzhwAr (bhakthi sAra), nammAzhwAr (satakOpa/parAnkusa), kulasEkara AzhwAr, periyAzhwAr (vishNuchiththa), thoNdaradippodi AzhwAr (bhakthAngri rENu), thiruppANAzhwAr (muni vAhana yOgi) and thirumangai AzhwAr (parakAla). They are also said to be 12 in number if madhurakavi AzhwAr and ANdAL (gOdhA – an incarnation of bhUdhEvi nAchiyAr, one of the divine consorts of bhagavAn) are included. While the 10 AzhwArs are said to be exclusively devoted to bhagavAn, madhurakavi AzhwAr and ANdAL were totally devoted to their AchAryas, nammAzhwAr and periyAzhwAr respectively. AzhwArs sung many pAsurams (verses) in glorification of SrIman nArAyaNan. These pAsurams total up to 4000 verses approximately and are thus called 4000 dhivya prabandham. dhivya means divine and prabandham means literature (that which captures bhagavAn himself). They brought out the essence of vEdham/vEdhAntham in simple and chaste thamizh. The whole purpose of these dhivya prabandhams is to uplift the jIvAthmAs by transmitting true knowledge. 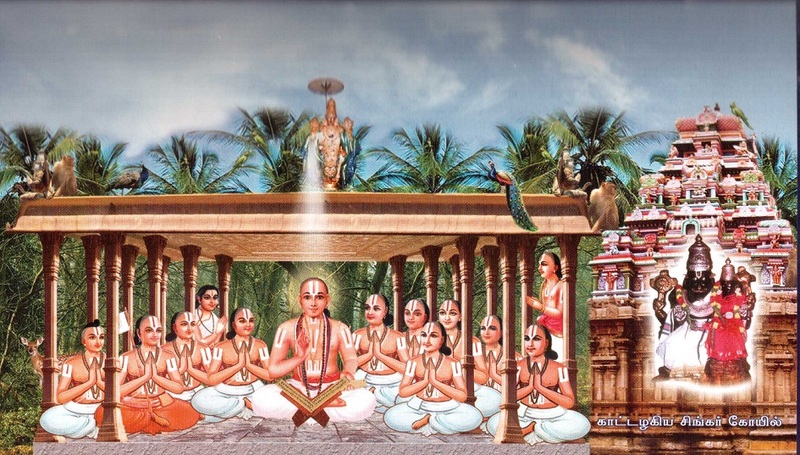 Several hundreds of years after the time of AzhwArs, many AchAryas starting with nAthamunigaL, centered with SrI rAmAnuja and ending with mAmunigaL appeared and preached the divine message of AzhwArs. While less intelligent people considered AzhwArs pAsurams as simple thamizh songs, the most intelligent AchAryas established that these pAsurams bring out the ultimate philosophy of SrIman nArAyaNan being the means (to be uplifted from this material world) and the goal (to be situated in ones true nature of eternal service to SrIman nArAyaNan in paramapadham – spiritual world). Our pUrvAchAryas fully relished the dhivya prabandhams and centered their life around learning them, teaching them and living by those pAsurams. SrI rAmAnuja (emperumAnAr) who is considered as an incarnation of Adhi sEsha and who appeared a century later received the same through the guru paramparA by studying the same under various AchAryas per the desire of yAmunAchArya. He then spread the glories of AzhwArs and their works to all sections of the society and greatly facilitated the propagation of this SrIvaishNava sampradhAyam. It is because of his great contribution, this sampradhAyam was declared to be known as SrI rAmAnuja dharsanam by SrI ranganAtha himself. Also, rAmAnusa nURRanthAdhi which was sung in glorification of SrI rAmAnuja by thiruvarangaththu amudhanAr was added into 4000 dhivya prabandham by the AchAryas due to his greatness. This rAmAnusa nURRanthAdhi is glorified as “prapanna gAyathri” – that which is to be recited compulsorily by all prapannas (ones who are surrendered) every day, just like how gAyathri manthram is to be recited by brAhmaNas everyday. nampiLLai is an important AchArya (coming in the parampArA after emperumAnAr, embAr, bhattar and nanjIyar) who should be mentioned at this juncture. He was living in SrIrangam and was the leader of SrIvaishNava sampradhAyam during his times. 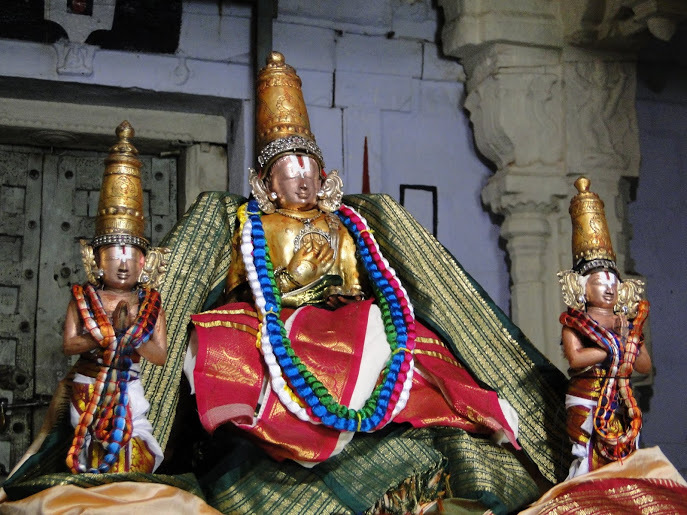 It was during his period in SrIrangam, the meanings of 4000 dhivya prabandham were given great importance. He was engaged in giving lectures everyday close to the sanctum sanctorium of periya perumAL – SrI ranganAtha. It is explained that even periya perumAL would stand up and try to peek through the window to hear his lectures. nampiLLai‘s sishyas also greatly contributed to propagate the meanings of these dhivya prabandhams. periyavAchchAn piLLai who is a sishya of nampiLLai and also known as vyAkyAna chakkaravarthy (emperor among commentators) wrote commentaries for all dhivya prabandhams and his contribution is greatly hailed by our AchAryas. 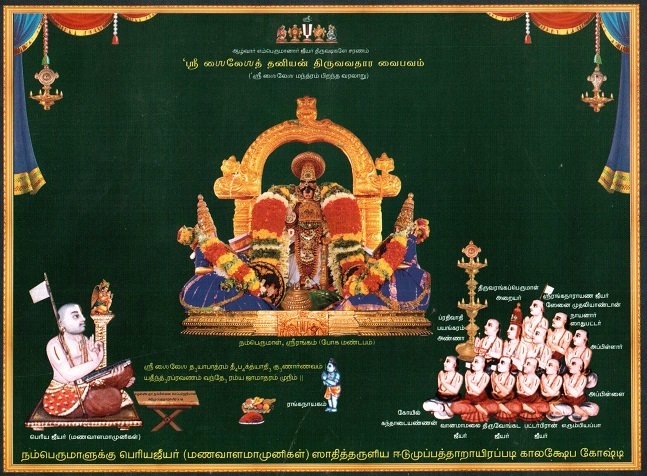 vadakku thiruvIdhi piLLai, who is another sishya of nampiLLai, documented the lectures given by nampiLLai on thiruvAimozhi and this document became to be known as eedu 36000 padi (the most cherished vyAkyAnam of thiruvAimozhi). After nampiLLai‘s time, piLLai lOkAchAryar leads the sath sampradhAyam and documents all the most confidential matters of dhivya prabandham in his rahasya granthams. These confidential matters were explained by various AchAryas at various times in various granthams. piLLai lOkAchAryar consolidated those and documented them in his 18 primary works. But towards the end of his life, tragedy struck SrIrangam in the form of mughal invaders who destroyed everything there. piLLai lOkAchAryar arranged for the safe journey of namperumAL (SrI ranganAtha – uthsavar) and escaped from the invaders from there along with namperumAL. Shortly in to the journey, he ascended to paramapadham due to the difficult journey through forests at such advanced age. Then came a lengthy period of suffering for the whole of SrIvaishNava community. After few decades, when peace prevailed and invaders were driven out, namperumAL eventually returned to SrIrangam. 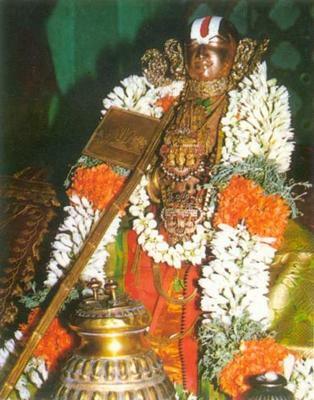 Finally, maNavALa mAmunigaL who is considered as an incarnation of SrI rAmAnuja himself, appeared in AzhwAr thirunagari. He became a sishya of thiruvAimozhi piLLai and learned all the esoteric meanings of vEdham, vEdhAntham and dhivya prabandhams from his own father and thiruvAimozhi piLLai. Under the orders of thiruvAimozhi piLLai (his AchArya), he reached SrIrangam and spent the rest of his life in rejuvenating the sath sampradhAyam to its past glories. He personally searched for all the lost literature, studied them, recorded them in palm leaves with great difficulty and preserved them for future generations to come. Fittingly, in appreciating his great qualities and efforts, SrI ranganAtha himself listens to thiruvAimozhi kAlakshEpam from mAmunigaL for a whole year and at the end of the lecture series, he himself appears as a small boy and accepts mAmunigaL as his AchArya and submits him the most glorious “SrISailESa dhayApAthram…” thaniyan. Subsequently, many AchAryas who came in various lineages taught and lived by these dhivya prabandhams. Thus, AzhwArs‘ dhivya prabandhams which were focussed on the upliftment of jIvAthmAs which is to fulfill the desire of bhagavAn have been preserved by our pUrvAchAryas through the history. It is emphasised greatly that all SrIvaishNavas should learn the dhivya prabandhams, understand the meanings properly and live by them. Keeping this in mind, with the aim of translating all of 4000 dhivya prabandhams, we are starting humbly in this great endeavour. We have a great desire to complete this translation kainkaryam by 2017 May, when we will commemorate the 1000th year appearance day of SrI rAmAnuja. Initially we are starting with English translation but we would try to arrange for translation of these dhivya prabandhams in other languages as well. With full dependence and faith on SrIman nArAyaNan, AzhwArs and AchAryas, we are planning to translate the dhivya prabandhams into simple English (and other languages too). We will provide word-by-word meaning for each pAsuram with specific highlights and important points from the vyAkyAnams. The website will be well organized and easily searchable. We would also attempt to add pictures wherever possible/applicable. With the blessings of bhagavAn, bhAgavathas and AchAryas, we plan to do a faithful kainkaryam of translating these dhivya prabandhams which will be useful for many generations to come. Though dhivya prabandham only indicates the thamizh pAsurams composed by AzhwArs (and rAmAnusa nURRanthAdhi of thiruvarangaththu amudhanAr), in this website/initiative, we would also cover many of the thamizh/samskritham prabandhams which are composed by our pUrvAchAryas in the “Other Prabandhams” section. We revere our AchAryas SrIsUkthis (divine compositions) greatly too and will also provide translation for the same as much as possible. Having no tamil literary sense I always felt I will not be able to understand every word of divya prabhandam though I learn it from a guru. Your service will be of a great help to overcome this hurdle & enjoy the pasuram to its full potential. A HUMBLE REQUEST, LIKE WORD-BY-WORD MEANING FOR EACH PASURAM, CAN YOU TRY FOR WORD-BY-WORD MEANING FOR VYAKYANAM OF EACH PASURAM. thanks for the feedback. Though we would like to translate the vyAkyAnam also fully, due to time constraints we may not be able to do at the moment. We would certainly note it down and try to address this in the future. Correct swamy that will e anble the readers to understand the importance and inner message and meaning. Adiyen Ramanujadasan. I was reciting the pasurams just like that as I did know the meaning of the all the words in each pasuram. Although, I could make out the meanings of some of the words in the pasurams, I was unable to extract the full meaning and thus the essence of the pasuram. The word to word meaning and the simple translation in English has helped me a lot to know the meaning of more words. Further, with your yeoman service, I am enjoying reading the two vyakyaanams provided for each pasuram, bringing out the whole lot real spiritual meaning behind each pasuram. Congratulations on this great effort to bring out our Divyaprabandam’s meanings and vyakyanams online.Please keep up the good work. Let this yeoman service of yours be a light to all devotees who really want to know and learn the pasurams with word to word and spiritual meaning. Really a Sacred Splendid involvement to uphold Vaishnava Siddantha. No words to praise.Adiyean Dhanyanaen. Excellent beginning.looking forward to the next lessons please. The write up gave a clear insight on the Azhwars,Acharyas and the Divyaprabhandam. Found it very useful. I request you to kindly include kannada version of this page, since there are many kannada visitors to this page as well. I want more kannada speaker to relish this divine knowledge. Surely, we will do – thanks for your suggestion. Thanks a lot for this Devine service. You are doing a great job. Alwar Tamil is very nice to hear( sundara Tamil) but very difficult to pronounce and understand for people of this generation. I want to learn Tamil Veda but not able as I am not able to understand. From your work I and many people will be able to learn pasurams. Thanks again, we are eagerly waiting for this website. Thanks for the encouraging words and the feedback. The website is already loaded with plenty of pAsurams/sthOthrams (thamizh/english) in multiple languages. Please feel free to go through the same. Please send Divyaprabandam in tamil.Is it available in your site for download? Thanks for your feedback. We are constantly adding e-books in our website as we complete series of articles. It will be impossible to keep up the single winzip file. We do have the e-books archived at http://divyaprabandham.koyil.org/index.php/e-books/ – they can be downloaded from there. great efforts and really helpful in knowing the svapadesham of the divya prabhandham . A basic Nasstiga question. When you do not have any one of your so called Gurus getting total of Nalayira Divya Prabandam, why call that in that way. Can you give any reference how and why it should be called so. People make comment that a small group (sect) in a corner of Hindustan claiming big things without any base. The count of 4000 is not absolute but is an approximation and rounding up. 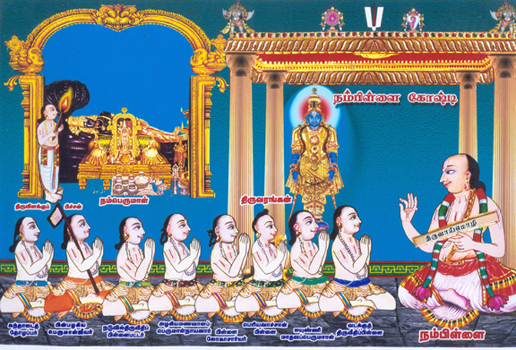 For example, nammAzhwAr says in many padhigams (decads), “AyiraththuL ippaththu” (these 10 pAsurams among the thousand) – but it is obvious that there are more than 1000 pAsurams in thiruvAimozhi. So, we need not be fixated on the count “4000” – traditionally the collection of the pAsurams were known as “aruLichcheyal” or “dhivya prabandham” only, without much emphasis on the count. There is sufficient literature supporting the philosophy – especially with all the commentaries, our SrIvaishNava philosophy is the one with the largest literary base more than any other philosophy. I am so thankful for your site. I am a bengali married to Tamil Vaishnavavite living in Dubai. I am greatly inspired to understand and imbibe the scriptures in Divyapravandham. I am going to benefit greatly from your endeavour. i am thankful and appreciate the spiritually inspiring works done on Divya Prabantham. How can I obtain all the books in English.